- How has the farm evolved over the years? We started in 2000 with 500 sows, and 5 years later we expanded to the 1,600 that we currently have. Precisely in 2005, with the expansion, we decided to work with a confirmed gestation barn with pens in groups of 250 sows and Mannebeck electronic feeding machines. That investment won us the PITA 2005 award (for Technological Innovation in Agriculture), given by the Government of Catalonia, for being pioneers in this type of system. - Which Rotecna products have you installed? - Why did you choose to work with Rotecna products? To begin with, we liked the good value for money of their products. From there, one of the things that we currently appreciate most about the company is the good, quick response that we always get from the technical service if ever we have any problem or doubt. Finally, a very positive thing about Rotecna is the advice that the agents give to clients: they listen to the farmer in order to offer the most suitable product for our needs. 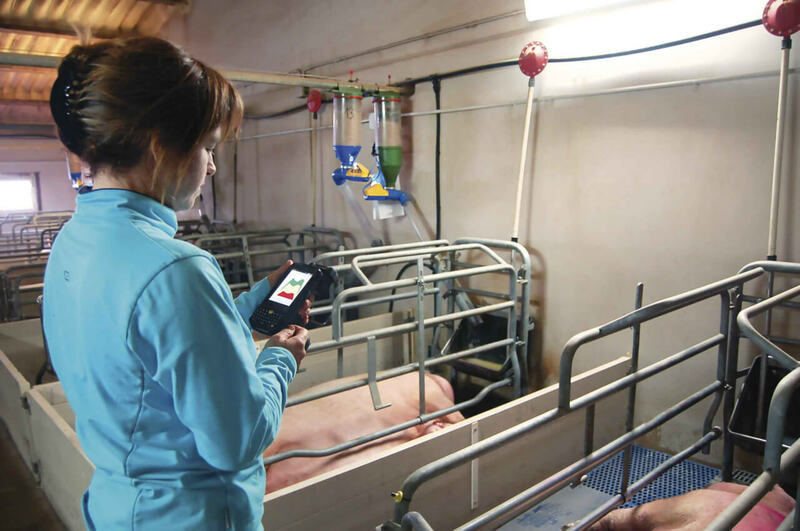 - In farrowing, you have decided to work with the Dositronic integrated electronic feeding system: why? First, I should mention that in 2014 we decided to try electronic feed supply in farrowing with the goal of providing the animals with fresh feed and saving time and staff with the daily management of the dispensers. So, we started to try electronic dispensers made by different brands and when Rotecna brought out the Dositronic, we decided to try that out too. Finally, we decided on the Dositronic because of the quality of the product, its features, the information it provides and, above all, because it's so very intuitive. Primarily that it is a very visual, intuitive and easy to use dispenser, any worker on the farm can use it. It is very easy at a glance. It does not require a lot of training, something important considering the amount of labour rotation on farms. In terms of everyday use, once you've established a feeding curve, you hardly have to touch anything, which means a major saving in time and personnel. As for the animals, they always have fresh feed, because unless they hit the pan's sensor with their snout, food won't be dropped. This maximizes the intake of feed and avoids waste. - In the day-to-day, how do you organize your work to bring out the best in the Dositronic? The first thing I do each day is to look at the computer to get an overview of how the farrowing sows have eaten. Then I go from barn to barn to see the information on site, it's very visual, it comes from the the Dositronic's lights and, depending on what I see, I use the PDA to view, from the barn itself, the sow's consumption history and make the necessary modifications to the feeding curve. - How many feeding curves do you work with? In the system we work with three different feeding curves: gilts, multiparous and lame sows. As for the rationing of feed, while animals consume up to three kilos, they eat two times a day, and from three kilos, we fraction intake in four daily rations, which means we avoid feed wastage. 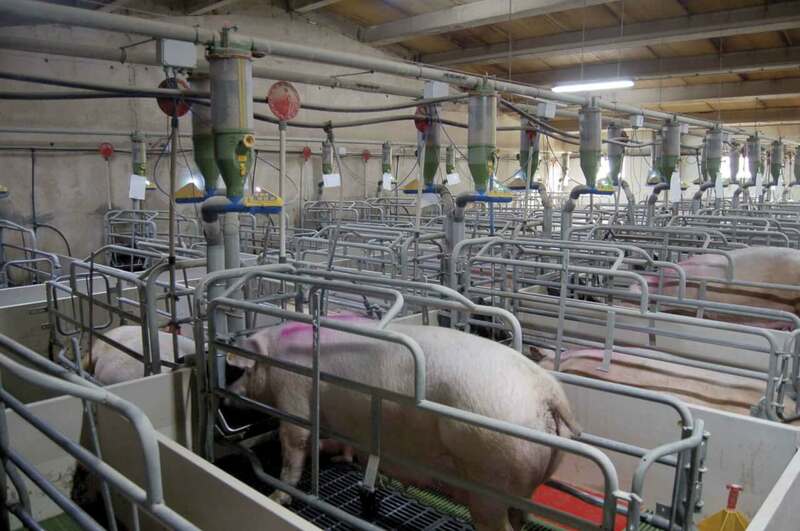 And then, as the animal gets up four times to eat, the water consumption is higher, so the sow produces more milk. - Do you think the Dositronic pushbutton panel is an advantage? It's a key factor. It's a very visual panel, which uses international symbols, that is to say it has a + sign if you want to increase the ration of food for the sow, a - sign if you want to reduce it, the picture of a sow with piglets that the worker should activate if he or she sees that a sow that has just delivered, and so on. It also works with very intuitive colours: white (everything is perfect), green (the sow has eaten properly), yellow (she has eaten less than the assigned ration) and red (the sow has eaten badly). The panel has the right buttons to modify basic parameters; to get more information and make more complex changes we have the PDA or the computer. - As for sow productivity, have you noticed improvements? The first thing that we have noticed in these first few months of use is that it has increased the consumption of feed and water by our sows, so they produce more milk, which is good for improving piglet weight. And the sows are more satisfied and calmer, so we have improved their well-being. On the one hand, to improve, whenever possible, our production figures and, on the other, we are not ruling out a further expansion of the farm".